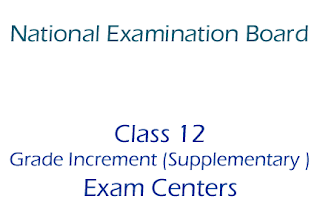 National Examination Board (NEB) published a notice about Class 12 Grade Increment (Supplementary ) Exam Centers. Exam Date : 2075 Bhadra 16, Time : 11:00 AM to 02:00 PM. View complete Class 12 Grade Increment (Supplementary ) Exam Centers 2075 below. You can download this also.